Whether you are a beginner looking to try a new sport, intermediate sailor, adaptive athlete, or even a seasoned racer, NESS is ready to get you out on the water. NESS offers a variety of general sailing programs as well as some specialty programs. 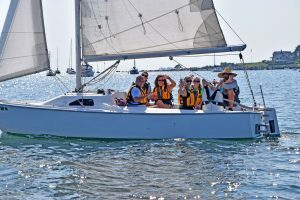 Our youth sailing programs include open enrollment classes at New London Community Boating (click here to learn more) and sailing summer camp at our Stonington location (click here to learn more and register). As a US Sailing recognized Community Sailing Center, we offer the highest standard of quality instruction and facilities. Whether you are a novice looking to try a new sport, intermediate sailor, adaptive athlete, or even a seasoned racer, NESS is ready to get you out on the water. At NESS, we aim to get everyone out on the water regardless of age, skill level, or ability. In 2017, in collaboration with Sail To Prevail, NESS launched its adaptive sailing program in Stonington, CT. Through our adaptive sailing program, NESS provides access to the ocean and takes students out of their comfort zones for personal growth and empowerment. Our adaptive teaching methods and specialized equipment support individuals with a variety of cognitive and/or physical disabilities. 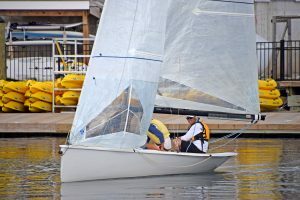 Using our adaptive-ready, specifically designed Sonar and Independence 20 sailboat, students with physical and cognitive disabilities will safely learn to sail with an experienced captain and teacher. Our adaptive sailing program brings the fun and therapeutic qualities of sailing to individuals with diverse needs. Please contact us to schedule a memorable sailing experience. Lessons are $150/session, scholarships are available. Contact us at sailing@nessf.org to register. Whether you are looking to learn a new sport or brush up your skills, learn to sail at NESS alongside other adults with one of our instructors. Viper 640: This 21-foot asymmetrical sailboat is a great way to take your sailing to the next level or to try out a new fun boat. Designed for a crew of 3-4 our instructor can take 2 or 3 students at a time. Students will learn about sail shape and rig tuning while sailing upwind and sailing reaching angles while flying an asymmetrical spinnaker downwind. 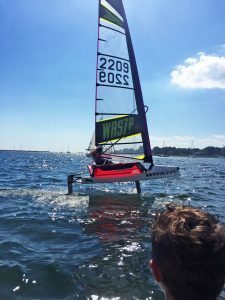 Are you an avid sailor who wants to discover the thrill of flying above the water while hydro-foiling? Whether you are an intermediate or advanced sailor NESS has the right platform for you. Sailing on either our UFO or Waszp you will learn key lessons in balance, apparent wind, boat set-up, and other high-speed sailing skills. Book a 2-hour lesson for a one-on-one lesson with our foiling experts or split the session with one or two of your capable friends. 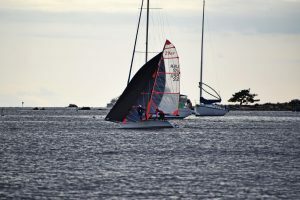 Sailors must have a strong level of dinghy sailing experience and must be fit enough for this high-adrenaline, all-action style of sailing. Contact us at sailing@nessf.org to reserve your spot. 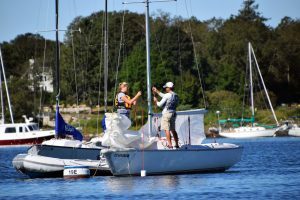 Are you an active sailor who is looking to learn about high school sailing and the sport of team racing? This program is open to students in grades 8-12 and will be sailed using NESS’s fleet of collegiate 420’s. No trapeze or spinnakers will be used so two sail boat handling and tactics will be the focus. 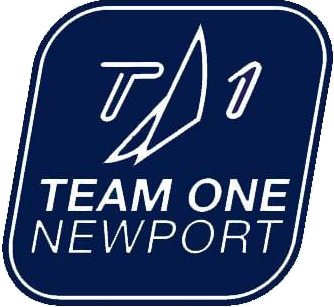 Team Racing is a fun fast pace style of sailboat racing pitting two teams against each other in a win-lose format. Stay tuned for start dates or email adventure@nessf.org for more information if you are interested. NESS is also the host site for the Williams High School Sailing Team. For more information regarding this team, please email Prescott Littlefield. Don’t own a boat? Rent one of ours! Once you become a qualified skipper by either taking our sailing classes or by passing a check out sail, you can come back to NESS and go sailing with your friends and family. Check-out Sail: Check-out sails are typically around 1hr in which a customer wanting to rent will have to perform a number of skills. Skills include rigging, sailing on and off a mooring, tacking, jybing, and de-rigging. Information about safety and the limitations of the boat are also covered. 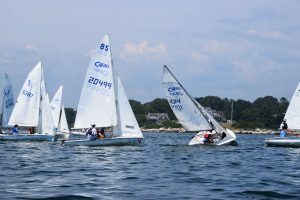 New England Science & Sailing offers programs for people of all ages.